Mattielene Abernathy, daughter of Reuben Bartow Abernathy and Bertie Evelyn Cox, wife of Ernest A. Buckner. 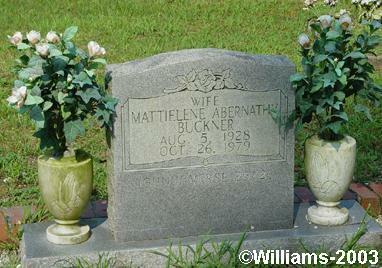 Mattie Buckner, 653 McBurnet Road, Marietta, died Friday. Funeral services were Sunday at Mt. Bethel Methodist Church, Marietta, with the Rev.John Moler officiating. Burial was in Old Macedonia Cemetery, Cartersville. Surviving are husband, Ernest A. Buckner; two daughters, Katherine Holland, New York, New York; Melba Holt, Kennesaw; two sisters, Mrs. Lee Deal, Mrs. John Bennett, both of Woodstock, one brother, the Rev. Hansel Abernathy, Cartersville; two grandchildren. Sisters are Helen Idella (Mrs. Lee Deal) and Bonnie (Mrs. John Bennett).